The robots were not able to carry soup or other foods steadily and broke down freqently. 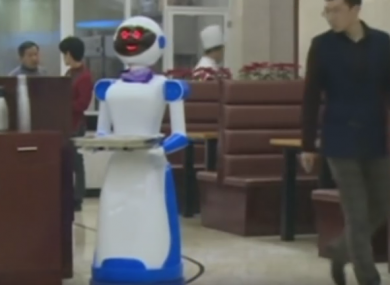 A string of restaurants in Gungzhou, China that used robots as waiters has run into a string of difficulties — ultimately closing down two restaurants and ditching almost all of their android assistants. According to Shanghaiist (which bases its report on a Chinese-language Workers’ Daily story), two restaurants in the Southern Chinese city have been forced to shutter due to constant issues. A big draw of the robots is their price — the initial outlay (50,000 Yuan — around $7,700) and subsequent upkeep cost is less than the wages of a human waiter. But there’s a problem: The robots are, in a word, incompetent. A third restaurant is reportedly getting rid of all but one of their robots in favour of traditional, living wait staff. One of the restaurant owners remarked that the robots attracted tourists, but weren’t economical. Email “Robot waiters did such a terrible job they forced two restaurants to close”. Feedback on “Robot waiters did such a terrible job they forced two restaurants to close”.